In the majority of cases I come across, Adwords accounts are typically under optimized and could use some lovin’. Their campaigns are usually running all broad keywords, are poorly organized, or are getting limited impression share due to low bids or loss of budget. However, I recently came across an account that was the opposite of this and it reminded me that it’s also possible to over optimize an account and not get the performance that you may be looking for. What mistakes could you be making with account over optimization? Perhaps you already know what people search to find your business. Don’t get me wrong – running on all exact can work really well for businesses with specific budgets and those who know exactly what search terms convert the best. In less familiar industries, it’s important to keep keyword options a little more broad to be able to capture a variety of searches that may be related to your business. Running only on exact match is restrictive and your business could be missing out. Not to mention, the rise of voice searches and long tail keywords have made it increasingly important for advertisers to think of their accounts more in themes as opposed to specific keywords. I’m definitely guilty of this. Sometimes when testing a number of keywords within an ad group, I see a good search term, so I make an ad group out of it. However, it turns out the keyword has a “Low Search Volume” or the ad group has triggered few impressions. Building out this ad group can be great if you want specific ad copy related to the search term, but otherwise, if it doesn’t give you many impressions or clicks, it doesn’t really give you enough data to work with. We as advertisers should always been testing various aspects of our campaigns. However, sometimes well-meaning advertisers don’t actually have enough data and will never get enough data to be able to test and get a statistically significant winner. I came across an account that was split testing landing pages within an ad group that got only a handful of clicks a month. It would take literally forever before the page would get enough hits to determine which was the better landing page. Similarly, I’ve seen campaigns testing three or more ads per ad group that get a relatively low amount of clicks. If you are making any sort of bid adjustment decisions on small sampling sizes, you may be jumping the gun on an account that has not collected enough data. I’ve recently been using a neat Adwords optimizing tool called Opteo that helps me make informed decisions about adjustments. 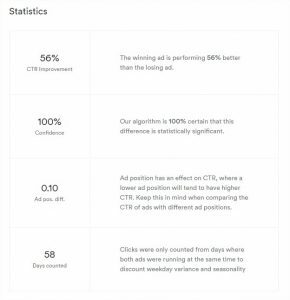 One of the cool features is when it tells me when I should pause a losing ad and gives me a list of stats – including their percentage of certainty based on their algorithm. The moral of the story? We should do our best to organize our account in such a way that we are getting enough data (if possible) to make informed decisions about how best to optimize our campaigns based on that data.